Sheathing Is Up! Well, Some Of It…. Several of them are still “hanging around” (heh, I amuse myself) up on the top plates to keep them out of the way. I need to set aside a block of time to take them apart and try to salvage all that metal strapping on their joints. If they won’t come apart, I’m considering throwing them onto the burn pile to remove the wood. I really would prefer not to, as the wood might be usable in some project, but I really want that strapping – it’s a nice, heavy gauge, and definitely reusable. The hurricane straps are all finally on the lower portion of the house, and the frame is looking strong! Even before putting them on, I could climb the structure like a monkey and nothing would move, but having all that extra strapping tying things together soothes the worrier in me. The weight it adds is negligible. There was nothing keeping me from starting on the sheathing, so I went for it! And quickly realized a big problem – I canNOT put 4×8 pieces of wood up by myself. Nope. Not gonna happen. So, what’s a girl to do? Why, ask her 78 year old mother for help, that’s what! Oy. It sounds worse than it was. I did all the heaving and hefting , and piled up cement blocks to prop the plywood sheets at the proper height. My mother just sort of leaned on them while I clamped them into place. She helped eye the spacing between sheets, too, while I shifted left, right, left, right, holy cow this is getting heavy, left, right… Yeah. I strongly recommend having at least two reasonably strong and healthy people working together during sheathing. Three would be better. One person…nope. Unless it was He-Man. Or The Hulk. 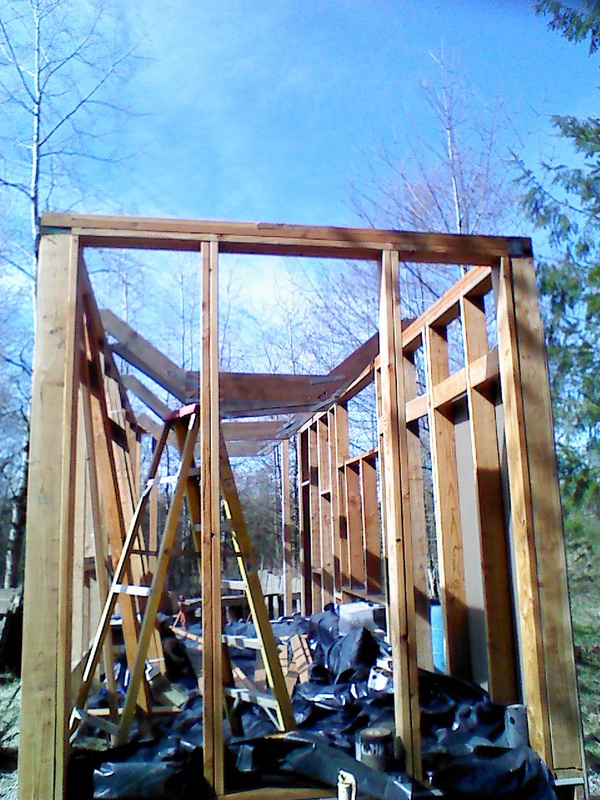 Working together, we got sheathing up all around the lower half of the house. None of the sheets are completely nailed up yet, only enough to hold them firmly in place. This has allowed the upper half of the vertically placed plywood sheets to wave in the wind a bit. I know it looks funky and unprofessional, so refuse to post a picture. Once everything is neatly nailed up, then I’ll get some pictures up for posterity. So. I need to finish nailing up all the sheathing that’s in place, and to salvage the metal straps from the failed trusses, and then to get the loft beams into place. Been popping outside to work between rain showers the last couple days. I plan to start on the loft by the end of this month, weather permitting. Yay! I want to put out a request to anyone reading this, to feel free to give feedback on my interior layout sketches. Did I miss anything? Is there something that you like, or don’t? ← Sunny Days Are Here (again)!